To analyze home buyers NAHB uses the American Housing Survey (AHS), a nationally representative survey of residential structures in the US and of the households who occupy them. This report uses the latest AHS release (2017) to provide insight on the characteristics of the roughly 8.8 million households who bought homes in the two years preceding the release of the 2017 AHS. This report also examines the characteristics of two home buyer subsets: first-time home buyers and trade-up buyers (those who previously owned a home). Analyzing these groups can provide insight into the types of households driving recent housing market activity. When appropriate, 2017 AHS findings are compared to those on recent home buyers in the 2015 AHS. The AHS, which is sponsored by the Department of Housing and Urban Development and conducted by the Census Bureau, is released biennially in odd-numbered years. Each data release is comprised of data from the preceding two years. For the purpose of simplicity, the data in this report will be described by the year of AHS release. Thirty-seven percent (3.3 million) of all recent home buyers were first-time buyers, slightly down from 39 percent in 2015. The typical home buyer was 40 years old, unchanged from the median age in 2015. Recent home buyers had a median household income of $86,623, up from a median of $78,739 in 2015. Twenty-seven percent of recent home buyers were racial or ethnic minorities, about the same as in 2015 (26 percent). The median price of homes purchased by recent home buyers was $228,389, up 10 percent from $208,573 in 2015. Recent home buyers purchased homes with a median of 1,890 sq. ft., essentially unchanged from 1,900 sq. ft. in 2015. Eleven percent of recent home buyers purchased a home without a down payment, the same share as in 2015. Fifty-two percent of recent home buyers used savings or cash on hand for the down payment, a slight decrease from 54 percent in 2015. The top reasons why recent home buyers decided to move were to 'move for a better home’ (55 percent), to ‘move for a better neighborhood’ (46 percent), and to ‘move to form a household’ (39 percent). As mentioned above, approximately 8.8 million households purchased homes in the two-year period prior to the 2017 AHS. Historically, the level of home buyers reached a cyclical high in 2005 (11.6 million), but after the recession hit, it dropped to a low of 6.8 million in 2011. The level climbed to 7.3 million in 2013 and 7.9 million in 2015, before jumping by almost 1 million to 8.8 million in 2017 (Graph 1). Source: NAHB tabulation of data from the 2017 American Housing Survey, Department of Housing and Urban Development and the U.S. Census Bureau. The 8.8 million recent home buyers can be further broken down into approximately 3.3 million first-time buyers and 5.5 million trade-up buyers. The level of trade-up buyers reached a high in 2005 (7.1 million), fell to a low in 2011 (3.7 million), then rose steadily in 2013, 2015, and 2017. The rise and fall in the first-time home buyer level was less extreme: it reached 4.5 million in 2005 and dropped to 2.9 million in 2013. Since then, it has inched up to 3.3 million in 2017. 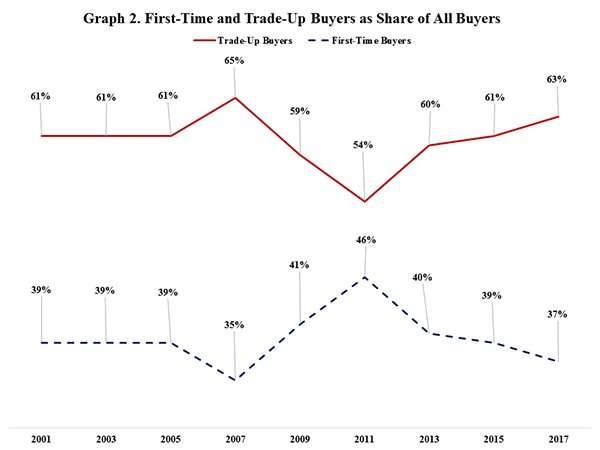 Graph 2 provides the percentage breakdown of all buyers by first-time and trade-up buyers. At 37 percent in 2017, the first-time buyer share hit its lowest point since 2007 (35 percent). Between 2001 and 2005, the first-time buyer share remained firm at 39 percent, dipped to 35 percent in 2007, then rose to 46 percent in 2011. The two-year period preceding the 2011 AHS included the time when the first-time home buyer tax credit was in effect. Since 2011, the first-time buyer share has gradually declined. With the tight credit conditions, rapid appreciation in home prices and income stagnation that marked the post-recession period, many prospective first-time buyers were likely priced out of the market or had trouble obtaining mortgages. As the first-time buyer share dwindled, trade-up buyers claimed a larger share of the market, going from a low of 54 percent in 2011 to 63 percent in 2017. In contrast to first-time buyers, trade-up buyers most likely benefited from the rise in home prices, as it provided an opportunity to build equity and “trade-up” to new homes. Median household income among all home buyers stood at $86,623 in 2017. It grew 13 percent between 2001 ($60,000) and 2007 ($68,200), then fell 4 percent to $64,998 by 2011. In the post-recession period, income growth accelerated, jumping by about 34 percent between 2011 ($64,998) and 2017 ($86,623), more than triple the rate of inflation growth over this period (Graph 3). 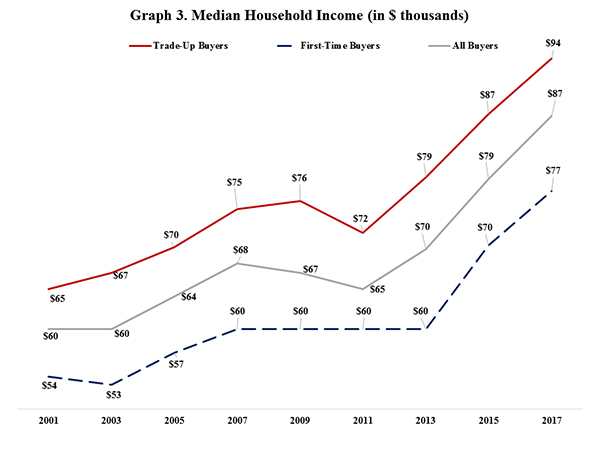 Median household income for trade-up buyers was $93,761 in 2017, about 8 percent higher than the median for all buyers. Meanwhile, median household income among first-time buyers was $77,212, about 12 percent lower than the all buyer median. For both first-time and trade-up buyers, median household income growth was moderate in the early to mid-2000s, then flattened or declined once the recession hit. Post-recession, income growth returned and accelerated for both groups. Recent home buyers had an average household size (average number of people in household) of 2.72 in 2017. Average household size declined from 2001 to 2011, falling from 2.84 to 2.61, before rising steadily in 2013, 2015, and 2017 (Graph 4). Average household size among trade-up buyers was 2.75 in 2017, higher than among first-time buyers (2.67). 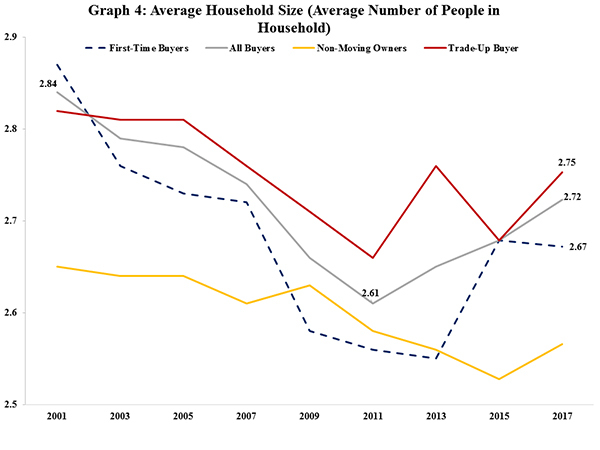 Like all home buyers, average household size among trade-up buyers and first-time buyers declined throughout much of the 2000s but has rebounded in recent years. In general, trade-up and first-time buyers have higher average household sizes than non-moving owners. Trade-up buyers and first-time buyers typically have higher rates of household formation, a factor that often leads to homeownership. It is important to note, however, that from 2009 to 2013, first-time buyers had a lower average household size than non-moving owners (Graph 4). Recent home buyers had a median age of 40 in 2017 (Graph 5). Historically, the median age of recent home buyers has been stable, staying in the territory of 38 to 40 years of age since 2001. Data from the AHS also show first-time buyers are younger than trade-up buyers. First-time buyers had a median age of 32, compared to a median age of 47 among trade-up buyers in 2017. Graph 5 also shows that the median age of first-time buyers has remained in the territory of 31 to 32 years of age since 2003. 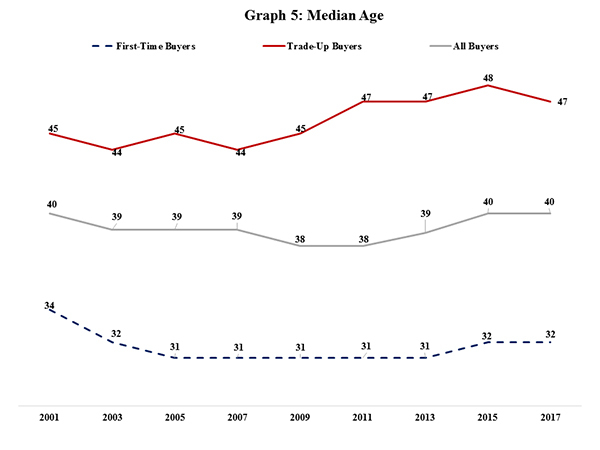 On the other hand, the median age of trade-up buyers has increased slightly: it hovered around 44 or 45 between 2001 and 2009, and then edged up to 48 in 2015 before sliding slightly to 47 in 2017. Twenty-seven percent of home buyers were of a racial or ethnic minority group in 2017 (Graph 6). The minority share of buyers has increased slightly over time, going from 23 percent in 2001 to 27 percent in 2017. Graph 6 also shows that first-time home buyers are more diverse than trade-up buyers. In 2017, 34 percent of first-time buyers were minority, compared to 22 percent of trade-up buyers. The minority share of first-time buyers shot up to 37 percent in 2015, but returned to 34 percent in 2017, which is about where it stood from 2001 to 2009. 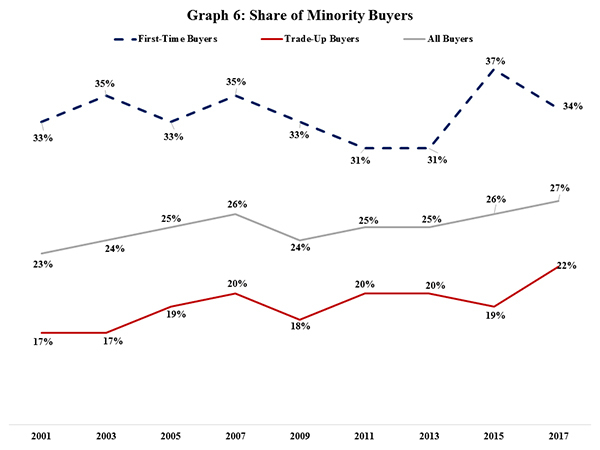 Meanwhile, the minority share of trade-up buyers has increased slightly over time, going from 17 percent in 2001 and 2003 to 22 percent in 2017. More facts about home buyers can be found in Table 1, available in the “Additional Resources” box. In addition to collecting important information about home buyers, the AHS also contains characteristics of the homes purchased, such as home price and square footage. Recent home buyers purchased homes with a median price of $228,389 in 2017. The median price of recently purchased homes increased from $144,000 in 2001 to $215,000 in 2007, fell to a low of $169,000 in 2013, then grew to $208,573 in 2015 and $228,389 in 2017. Homes purchased by first-time buyers had a median price of approximately $193,354 in 2017, 15 percent lower than the median for all homes purchased. Trade-up buyers paid a median price of about $262,957 for their homes in 2017, 15 percent higher than the median for all homes purchased. 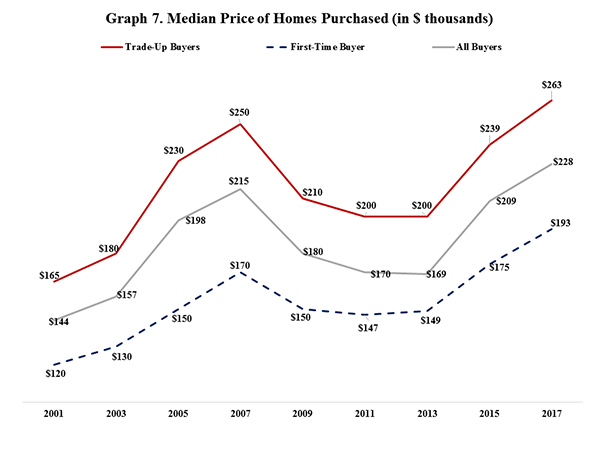 From their trough points in 2011 to 2017, the median price of homes purchased by first-time buyers and trade-up buyers both increased by about 31 percent (Graph 7). The median square footage of homes purchased by recent home buyers stood at 1,890 in 2017, about the same as in 2015 (1,900 sq. ft.). 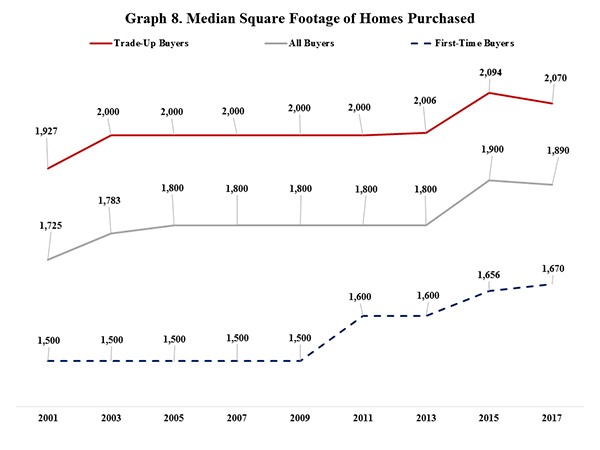 From 2005 to 2013, the median square footage remained unchanged at 1,800 (Graph 8). The median square footage of homes purchased by first-time home buyers was 1,670 in 2017, 400 sq. ft. below the median square footage of homes purchased by trade-up buyers (2,070 sq. ft.) (Graph 8). The median square footage of homes purchased by first-time buyers has been trending upwards since the housing recession, going from 1,500 sq. ft. in 2009 to 1,670 sq. ft. in 2017. On the other hand, the median square footage of homes purchased by trade-up buyers was essentially flat until 2013 (2,006 sq. ft.), then inched up to 2,094 sq. ft. in 2015 and edged back to 2,070 sq. ft. in 2017. More facts about the homes purchased can be found in Table 2, available in the “Additional Resources” box. More than half of buyers – 52 percent -- used ‘savings or cash on hand’ as their down payment source in 2017, while 26 percent used the sale of a previous home, 11 percent had no down payment (zero percent down or all cash purchase), and 3 percent acquired the home as an inheritance or gift. The remaining 8 percent of buyers used some other form of down payment not listed in the survey (Table 3 in Appendix). Most first-time buyers – 73 percent -- used their savings to make a down payment on their house in 2017, compared to only 39 percent among trade-up buyers (Graph 9). Unlike first-time buyers, trade-up buyers can use the sale of a previous home as a source of payment. In fact, 43 percent of them did in 2017. The share of first-time buyers using savings hit a low point in 2007 (57 percent). Since 2007, the share of first-time buyers using savings has increased, returning to about the same level as in 2001 (72 percent). 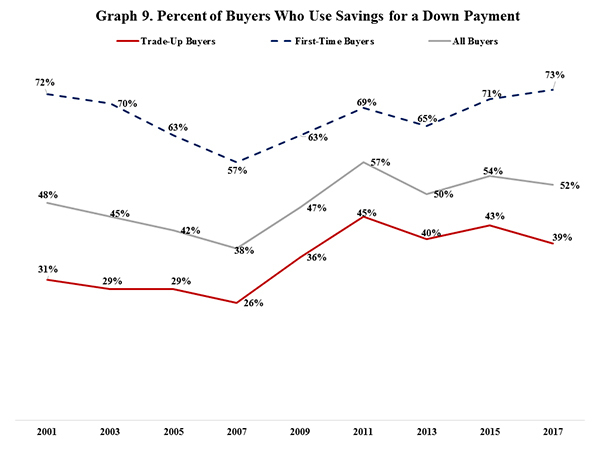 Meanwhile, the share of trade-up buyers using their savings/cash as the down payment source rose from 31 percent in 2001 to 39 percent in 2017. 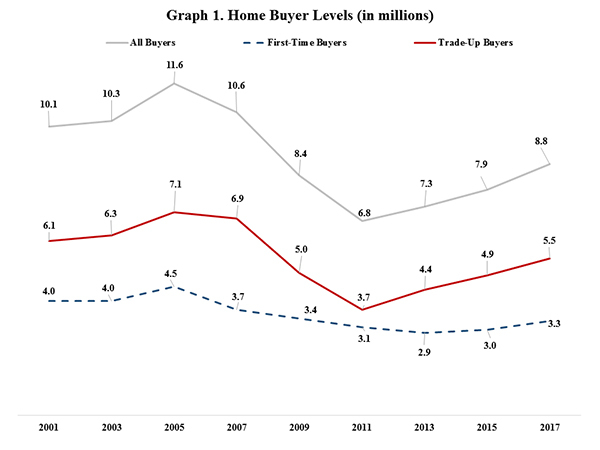 Graph 10 shows the history of buyers who purchased a home without a down payment. 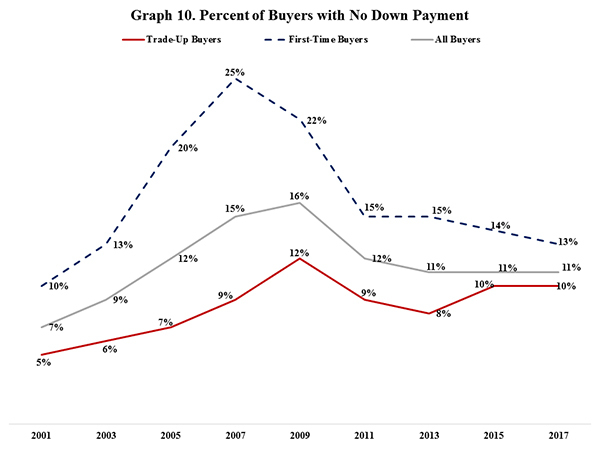 The share of first-time buyers without a down payment grew significantly in the mid-2000s and reached a cycle high of 25 percent in 2007, much higher than the share of trade-up buyers (9 percent). By 2011, however, the first-time buyer share with no down payment dropped to 15 percent, and by 2017, it stood at 13 percent. The shares of first-time and trade-up buyers with no down payment were relatively close in range in 2017: 13 percent and 10 percent, respectively. The AHS also asks home buyers about their reasons for moving. 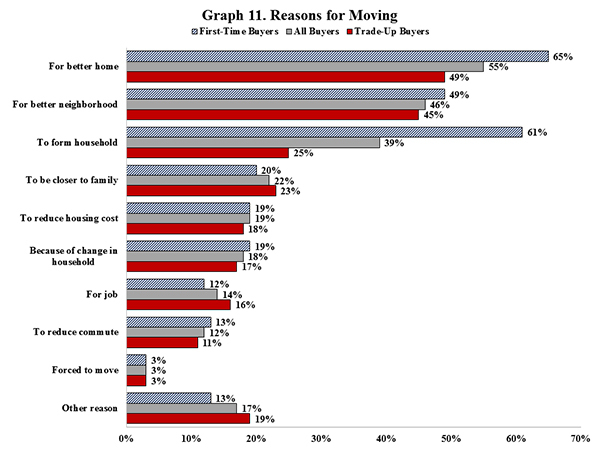 In the 2017 AHS, the top reason recent buyers moved was ‘for a better home’ (55 percent), followed by ‘for a better neighborhood’ (46 percent), and ‘to form a new household’ (39 percent) (Graph 11). A higher share of first-time buyers – 65 percent -- report a reason to move was ‘for a better home’ than trade-up buyers (49 percent). Likewise, a larger share of first-time buyers report forming a new household as a reason for moving (61 percent) than trade-up buyers (25 percent). The shares of first-time and trade-up buyers who moved for a better neighborhood were 49 percent and 45 percent, respectively. More statistics on the home buying process are available in Table 3 under the ‘Additional Resources’ box. The ‘Additional Resources’ box also contains the history for Tables 1,2, and 3 going back to 2001. The first-time buyer share trend in the AHS differs from the first-time buyer share trend seen in the report, Profile of Home Buyers and Sellers, based on a survey conducted by the National Association of Realtors (NAR). The AHS shows a steady, persistent decline in the first-time buyer share from 2011 to 2017, while the NAR report shows a sharp decline from 2010 to 2015, and an uptick in 2016. It is important to note that the AHS and NAR methodologies differ. For example, the time period for data collection is one year for the NAR survey, compared to two years for the AHS. The NAR survey also allows for the possibility of counting buyers who previously owned a home as first-time buyers, if that home was acquired through a gift or an inheritance.